At times, a surgical program shows patient outcomes that are better than average but then a few bad outcomes get added to the analysis later on and the program’s above average ranking doesn’t last. In these situations, statistics often proves that the temporary difference was just due to luck (p value > 0.05). When a bypass program is given a rating of “above average” (or 3 stars), it is because their results are established to be superior to other programs using a variety of proven mathematical tools that are the state of the art in statistics. In this case, the difference is not a temporary trend but illustrates a true difference in skill and/or quality compared to the 1 and 2 star rated heart surgery programs. The ConsumerReports® website for heart bypass programs shows a mix of cases done using either the open chest approach or a robotic technique. No site just reports the outcomes of robotics and no program offers only robotic heart surgery without also doing open chest cases. So ConsumerReports® only partially reflects robotic surgery, but at the programs where Dr. Poston has practiced robotic surgery has always represented the majority of the bypass cases that are done. Robotics inherently avoids some of the main complications that affect the rating scale (for example, sternal infection and stroke are rare from robotics). So good results are usually driven by the robotic cases. 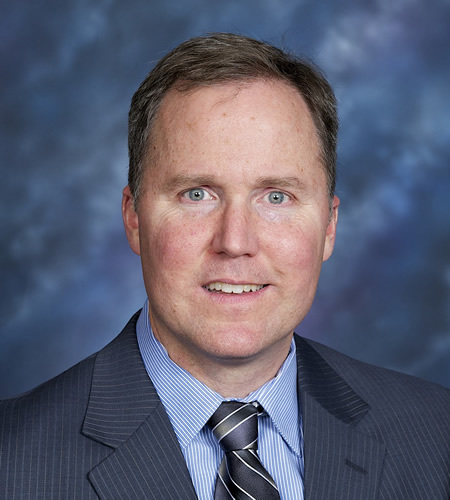 Dr. Poston’s experience at University of Arizona (UA) from 2011 until 2014 illustrates the results achieved from this mix of robotics and open cases. Over a 4 year period, the robotic heart surgery program at UA was the third busiest in the country and represented the bulk of bypasses done at UA during that period (377 robotic out of 553 total bypass cases). 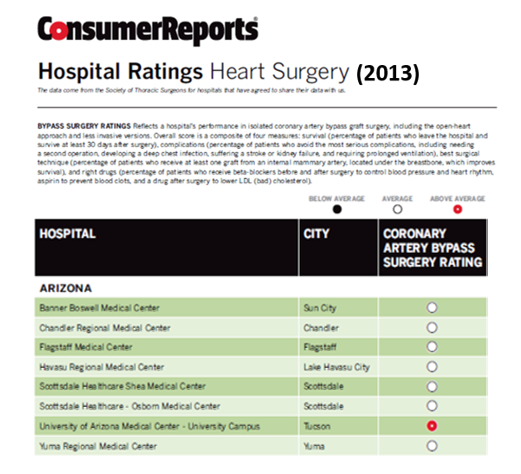 In ConsumerReports® report card for heart bypass programs in 2013 (see table below), UA was the only program in the state of Arizona that achieved a 3 star rating. Since Dr. Poston left UA in 2014, robotic heart surgery has no longer been offered and only open chest approach is used to perform bypass procedures. 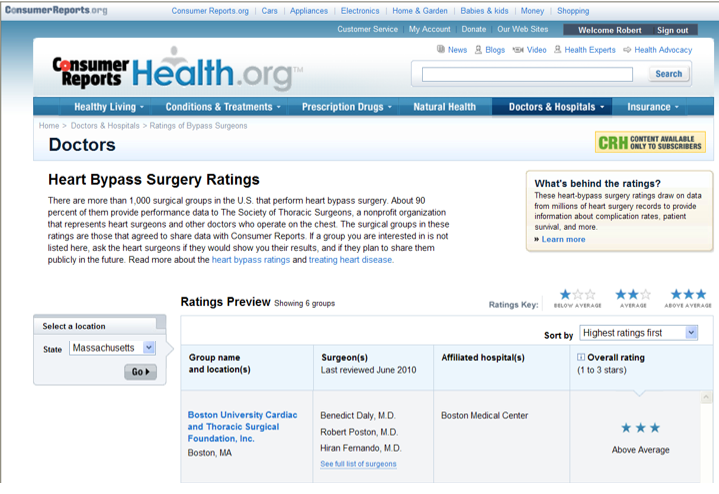 The reporting period for 2015, which demonstrates the results for open chest bypass, shows UA is now rated at 2 stars (http://www.consumerreports.org/health/doctors-hospitals/surgeon-ratings/ratings-of-bypass-surgeons.htm?state=AZ). A similar phenomenon occurred with the ranking of the heart bypass program led by Dr. Poston when he was at Boston University (BU). 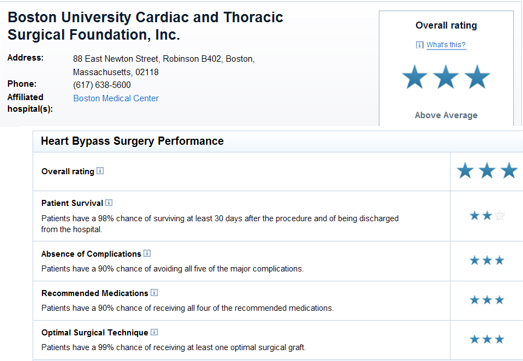 Two years after his arrival with robotics as the predominant approach for bypass grafting (2009), BU achieved a 3 star rating for its heart bypass program. Again, robotics stopped being offered after Dr. Poston left in 2010 and the very next rating that was released for 2011 listed the BU program at 2 stars. Heart bypass outcomes are extremely good across the US, with mortality rates after surgery now averaging less than 2%. The UA and BU examples illustrate the power of an experienced robotics program to drive improved patient outcomes and compete on the basis of outcomes in an extremely competitive landscape. The new robotics program in Trenton (SFMC) has evolved over the past year similar to the ones in Boston and Tucson. Since Feb 2015, the majority of bypass procedures in Trenton have been done using robotic, less invasive techniques (125 out of 199 bypass cases). There is no star ranking available yet because the program is still new, but an up-to-date analysis of the STS database results for our bypass program over the past year demonstrate excellent outcomes for all patients after bypass grafting. Even though the expected rate of mortality and complications in our patients was 15.2%, the actual observed rate of postoperative complications was only 14.3%. The mortality rate, or number of deaths, after bypass was also less than expected (1.9 vs. 2.2%). After performing over 200 bypass procedures at SFMC, there have been no strokes or sternal wound infection (SWI). These outcomes will likely result in a rating of 3 stars (although the 2015 ranking is not available at this point). It represents mainly the ability of a robotic approach to avoid stroke or sternal infection at SFMC as has been demonstrated in Tucson and Boston before. Here is a complete analysis of the results at St Francis for cardiac surgery over 2015-16. For a complete analysis of the results at Mt View Medical Center 2017, please follow this link.